Malay-Indonesian is spoken – surprise – in Malaysia and Indonesia. Actually, we kinda fudged the numbers on this one because there are many dialects of Malay, the most popular of which is Indonesian. But they’re all pretty much based on the same root language, which makes it the ninth most-spoken in the world.Indonesia is a fascinating place; a nation made up of over 13,000 islands it is the sixth most populated country in the world. Malaysia borders on two of the larger parts of Indonesia (including the island of Borneo), and is mostly known for its capital city of Kuala Lumpur. To say “hello” in Russian, say “Zdravstvuite” (ZDRAST-vet- yah). Hindustani is the primary language of India’s crowded population, and it encompasses a huge number of dialects (of which the most commonly spoken is Hindi). While many predict that the population of India will soon surpass that of China, the prominence of English in India prevents Hindustani from surpassing the most popular language in the world. If you’re interested in learning a little Hindi, there’s a very easy way: rent an Indian movie. The film industry in India is the most prolific in the world, making thousands of action/romance/ musicals every year. 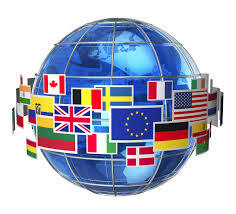 While English doesn’t have the most speakers, it is the official language of more countries than any other language. Its speakers hail from all around the world, including the U.S., Australia, England, Zimbabwe, the Caribbean, Hong Kong, South Africa, and Canada. We’d tell you more about English, but you probably feel pretty comfortable with the language already. Let’s just move on to the most popular language in the world. Surprise, surprise, the most widely spoken language on the planet is based in the most populated country on the planet, China. Beating second-place English by a 2 to 1 ratio, but don’t let that lull you into thinking that Mandarin is easy to learn. Speaking Mandarin can be really tough, because each word can be pronounced in four ways (or “tones”), and a beginner will invariably have trouble distinguishing one tone from another. But if over a billion people could do it, so could you. Try saying hello!